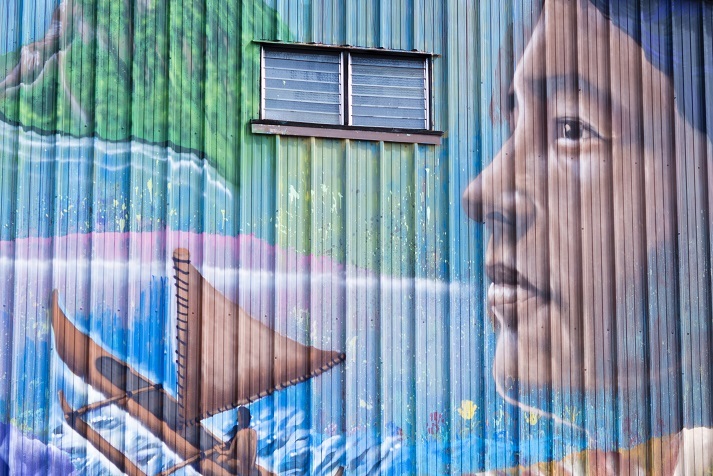 Hilo Living Legacy mural celebrates landmarks in Hawaiian language revitalization. “The breath of the people dies with the language.” This is how Dr. Keiki Kawai`ae`a, director of Ka Haka Ula O Keelikōlani (KH`UOK), UH Hilo’s College of Hawaiian Language, describes the cultural repercussions that come with the decline of a spoken language. With European colonization and American annexation, 'ôlelo Hawai`i (the Hawaiian language) suffered severe losses in the number of fluent speakers able to pass on traditions, perspectives, lessons, and many other facets of Hawaiian culture that make it unique. But in the past several decades, significant strides have been made not only in preserving 'ôlelo Hawai`i, but in bringing it back as a spoken language. 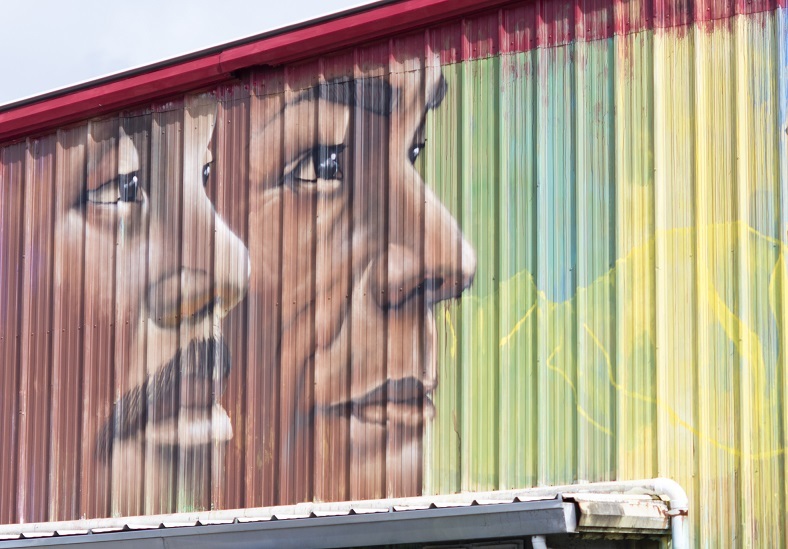 The Living Legacy Murals campaign, sponsored in part by UHH’s KH`UOK, seeks to celebrate that progress through the creation of ten murals throughout the state of Hawai`i that portray the mo`olelo, or story, of Kalapana. The project commemorates the 30th anniversary of Ka Papahana Kaiapuni Hawaiian Immersion Schools and the 40th anniversary of 'ôlelo Hawai`i being recognized as an official state language. The mo`olelo of Kalapana tells of his mother, Halepâkî from the island of Kaua`i, and his father, Kânepôiki from Kona, who is killed by Kalaniali'iloa, the chief of Kaua`i, after losing a ho'opâpâ, or strategy game of wit, challenge. Kalapana journeys to Kaua`i to avenge his father’s death and prevails over Kalaniali'iloa, defeating him by using his knowledge of `ai (tools), winds, rains, plants, and songs. The installment in Hilo, which is the third in the Living Legacy series, is located at 51 Maka`ala St. and portrays Kalapana exercising his ho'opâpâ skills after finishing his training with Kalaoa and then travelling to Kaua`i. Each of the ten murals is painted by ' una Pâheona, a group of creatives led by graffiti artist John “Prime” Hina. The state of Hawai`i offers an educational system with a complete pathway in Hawaiian immersion from pre-K to college. For 'ôlelo Hawai`i, this model is extremely important for language revitalization and is internationally recognized in successful indigenous language rehabilitation and development. In this model, younger generations are brought up in an environment that encourages consistent use of the language, strengthening the roots through which the language can continue to grow. “We all aspire to prepare our children in their thinking and concepts, and hopefully through the process of immersion education, we will continue revitalization through families, in the workplace, and by building communities,” explains Kawai`ae`a, director of KH`UOK. Language makes up the threads that bind a culture together, give it shape and substance, and allow for it to be handed down from one generation to the next. When a culture loses its traditional language, it’s not just the semantics and syntax that gets left behind, but the rich meanings, interpretations, and worldviews embedded in the language that are lost too. Many indigenous languages around the world are in danger of extinction as global communication increasingly favors languages such as Mandarin Chinese, English, and Spanish. The United Nations’ Educational, Scientific, and Cultural Organization estimates that if nothing is done, 43 percent of planet Earth’s 6,000 languages could disappear by the end of the century. The movement behind revitalizing 'ôlelo Hawai`i is indeed something to celebrate, and is precisely what the Living Legacy Series hopes to memorialize.